The Golden Chick Concept is a family oriented quick-service with dine-in, drive-thru, and optional home delivery service capability. 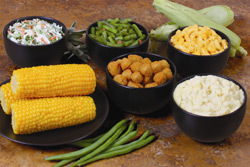 We offer a variety of menu items, featuring our Golden Fried Chicken and Golden Tenders which are prepared in our proprietary mixes and batters. Along with these items we also offer hand-rubbed Golden Roast Chicken and southern style catfish. Side items include, battered french fries, creamy homemade cole slaw, mashed potatoes, country style cream gravy, green beans, macaroni & cheese, corn on the cob, gourmet style chicken salad, fresh baked yeast rolls, sandwiches, soft drinks and freshly brewed iced tea. 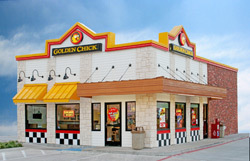 Use of the Golden Chick Brand name and slogans like "The Original and Still the Best"
*Franchise fee will increase to $25,000, $15,000 for each additional location, effective July 1, 2008. Click on Request Information button above for FREE information on how to start a Golden Chick franchise today! Please Note: Golden Chick franchises for sale, and other franchise opportunities, business opportunities, businesses and franchises for sale on this web site are not to be considered as an "offering", "franchise offering", suggestion or recommendation by GlobalBX. The franchises, businesses and business brokers seen on this web site submit their own individual content. This advertisement depends entirely on the truthfulness of the information provided by our advertisers which includes, but is not limited to, franchisers, franchises, franchise brokers, franchise consultants, business sellers and business brokers. As always, GlobalBX recommends that you consult a lawyer, financial consultant, accountant or professional advisor before buying a franchise or business opportunity or any type of business. By submitting this form and requesting more information, you have agreed to all terms and policies of GlobalBX and the business and franchise offerings listed here. Please review our Terms & Conditions for more information.